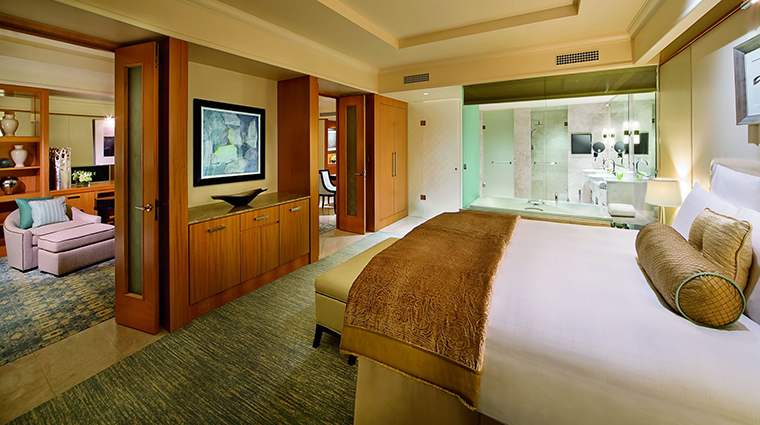 Tucked inside Dubai’s business district, The Ritz-Carlton, Dubai International Financial Centre is a model of refinement. The crisp, contemporary design combines elegance and intrigue with a 10-story cascading waterfall, bubbling fountains and art deco design expertly accentuated with Arabic elements. 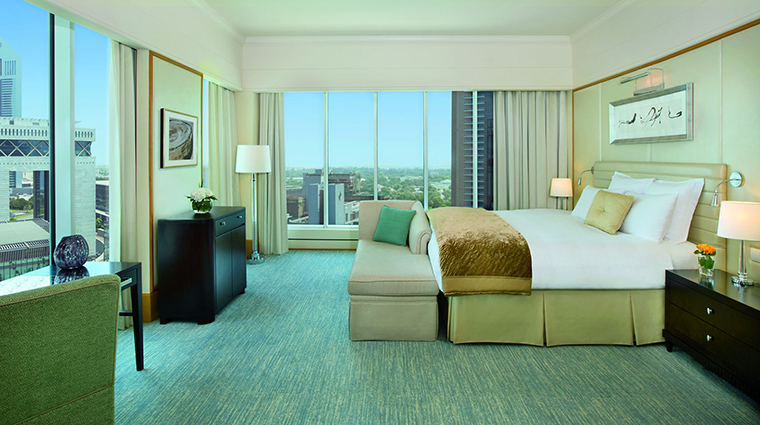 The luxury hotel’s 341 rooms and suites have a similarly tasteful vibe with sophisticated furnishings and floor-to-ceiling windows that afford fantastic views of the city. Along with seven restaurants and lounges serving international cuisines, two swimming pools and a luxurious spa and salon, this Forbes Travel Guide Four-Star hotel offers a memorable stay, whether you’re visiting for business or leisure. The property has a great location within the Dubai International Financial Centre. It’s attached to Gate Village, an area teeming with art galleries, restaurants and bars, and its proximity to downtown and the Dubai Mall means that the city’s best shopping, dining and nightlife are just a 10-minute drive away. Have a rejuvenating session at The Ritz-Carlton Spa; massages, facial and body treatments restore equilibrium using techniques from as far as Bali, Mexico and India, along with Arabian-inspired ingredients. Try the Sensory Journey, which incorporates argan, rose and almond flowers, or The Desert Reviver, which includes a full-body sand exfoliation, a hot-stone massage and an application of a cooling balm. Tiny travelers are guaranteed to have a great time thanks to the Ritz Kids program. It provides children with pint-sized amenities, including a coloring book, a welcome card and gifts, along with a dedicated menu at all of the property’s restaurants. You can even request to have a mini in-room kids tent set up for your little ones to sleep in. With excellent in-house dining options, food is a strong point at this Dubai hotel. Get an authentic Belgian meal at Café Belge, French cuisine at an outpost of the famed Le Cirque or a succulent steak at Center Cut. Sip on botanical-and-herb-infused cocktails in the tranquil garden space of Flair No. 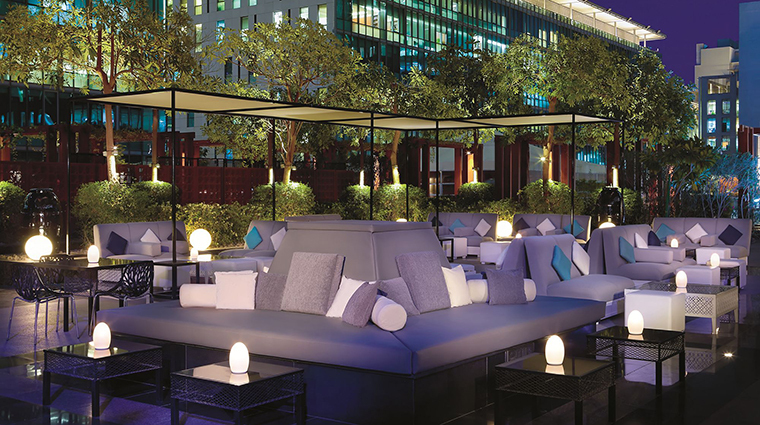 5 as you enjoy lounge music by the resident DJ at this alfresco hot spot. Make use of the free weights, machines and cardio equipment at the 24-hour fitness center or request a personalized program that includes nutritional information, body composition tests and individualized training. If you have had enough of the desert sun at the outdoor pool, head to the sanctuary-like heated indoor pool for some shaded relaxation. This is not a pet-friendly hotel, so you will have to leave Fido with a sitter. Spacious art-deco-influenced rooms sport a clean, contemporary look in hues of white, sky blue and gray complemented by light wood finishes. Abundant natural light brightens up the spaces, thanks to floor-to-ceiling windows. White marble covers the bathrooms, which have separate rainforest showers and deep-soaking tubs along with perfumed Asprey products. Coffee lovers will appreciate the in-room Nespresso machines. 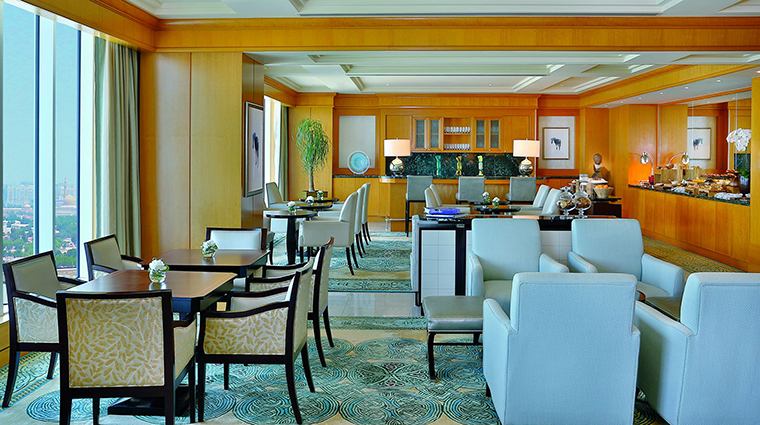 Upgrade to Club Level accommodations to enjoy access to the exclusive Club Lounge that serves food and beverages throughout the day, a dedicated concierge and a secluded spot to unwind. 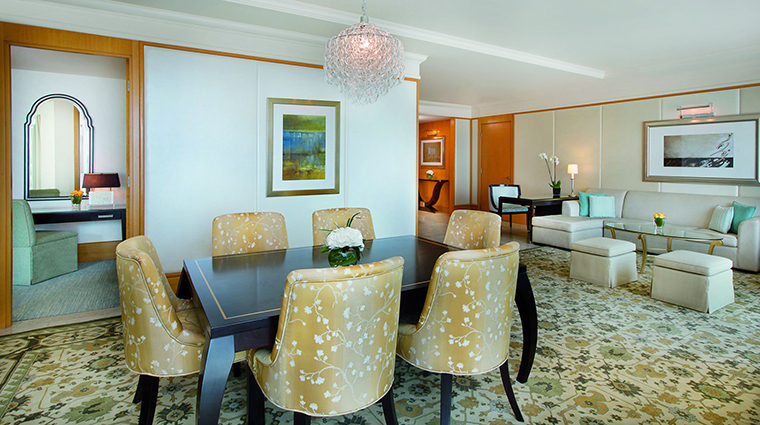 For a stay fit for royalty, reserve the Royal Suite. It has a study, living and dining rooms; a fully equipped kitchen; a Jacuzzi; and butler service. Plus, airport transfers are included. Savor the ambiance of a 1920s-era European café when you dine at Café Belge, a Belgian-inspired venue serving up traditional dishes, fresh seafood and an exceptional selection of beers. Tuck into savory specialties such as the chef’s oyster selection, seafood linguine and lamb navarin(a meaty French stew). Sample French cuisine with Italian flair at Le Cirque, the sleek Dubai branch of the iconic NYC restaurant. Order the foie gras parfait, lobster risotto or duck à l’orange, or opt for the set menu paired with exquisite French wines. When you’re craving a steak, head to Center Cut and feast on a curated selection of U.S. and Australian beef with creatively crafted condiments (like mango barbecue sauce) and quality wines. From European and Asian to Indian and Middle Eastern, there is something for everyone at the bright and modern Cara, where a buffet breakfast and lunch are served daily, as well as an à la carte menu. Spend a leisurely afternoon at the Lobby Lounge & Terrace and experience the luxury hotel’s afternoon tea that comes with a variety of sandwiches, cakes and scones along with a wide selection of coffee and teas from around the world.